Reading or explaining any weather forecast, most of the time areas and regions are mostly mentioned by ‘Directions’ (like eastern, western, northern, southern or NE, NW, SE, SW) not areas names. Most or many of common people do not understand or find exact locations by these directions or may confuse a bit when they listen or read the updates. 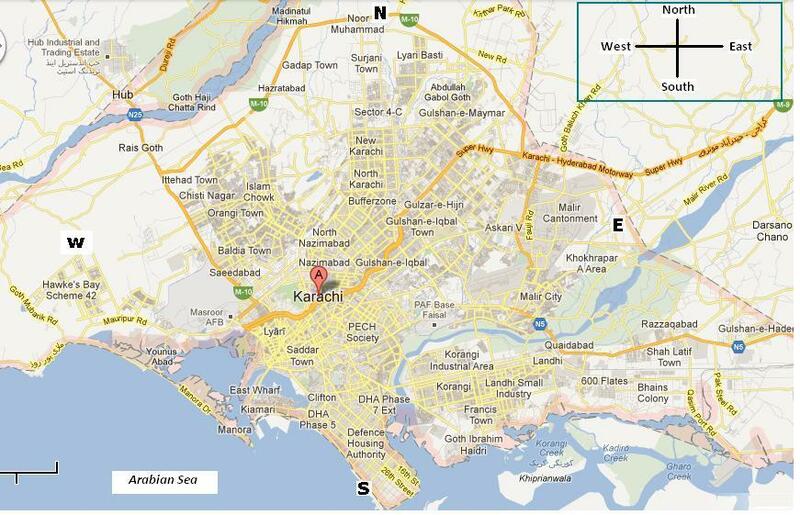 I have already written an article about “Map of Karachi” published by PWP in December 2012 (to provide know how about ‘geographic location of different localities of Karachi’). Given matter is an attempt to make people get the ‘Concept of Directions’ on the Maps as well at their own location like home or any workplace. Detail narrated in Urdu is for the purpose to share this knowledge with maximum common people and to avoid any confusion in given methods or details given in the article. Send your weather articles, ideas, videos or pictures on babar.cyclone@yahoo.com Your article would be published on Pakistan Weather Portal (PWP) with your name and city, without any changes. Views expressed on Portal Interactive does not represent Pakistan Weather Portal (PWP) So you could also be the part of Portal Interactive! ← Unexpected Monsoon may worsen the Thar drought! ab is mai “SSW” ka kaya matlab hai?